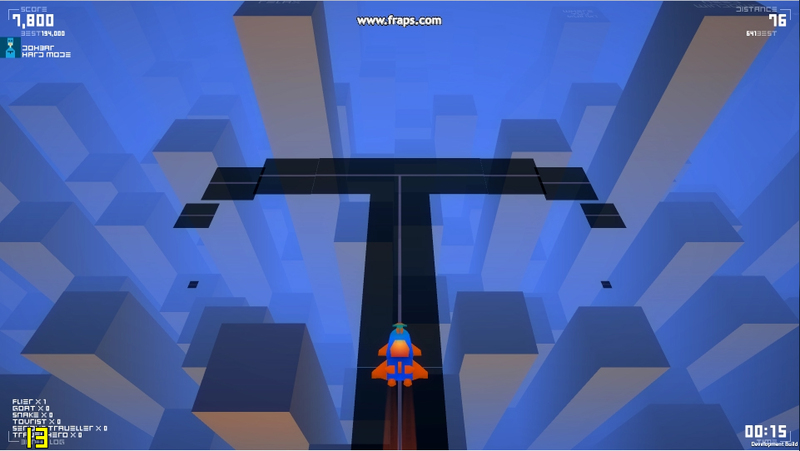 Imagine racing along on a track high over an infinite city of blank skyscrapers, the road barely appearing in front of you before you’re jetting over it in your rocket-powered race car. Left, right, left, left, jump the gap, swing sideways to dodge a divider, right, right. CRAP! Took the turn too fast. 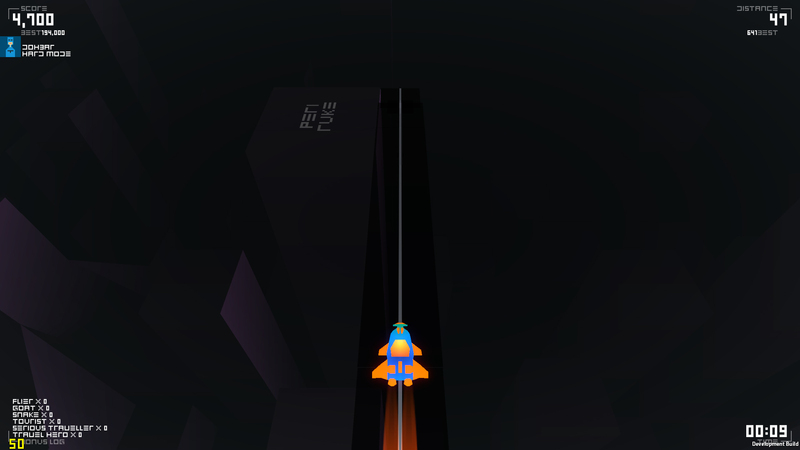 Your rocket car spirals into the city below. 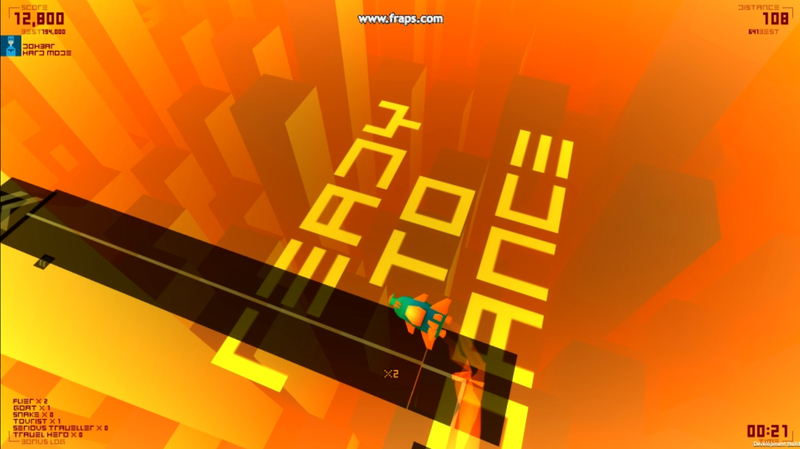 The background electronic music track is part of what makes the game so addictive. I want to survive to hear the music continue and not end up with that jarring, warped “you just died” version of the music that accompanies the game’s inevitable end. Speedfreak mode: Certain parts of the track speed you up and they come in two varieties. One is a straightaway filled with barriers and dividers. It’s okay. Not too difficult to pass it once you get the timing down, and it doesn’t earn you much in the way of points. The other kind, my favorite kind, is the twisty-turny snaking path that builds itself before you so fast you can only react on instinct. That builds up your combo multiplier and is just plain exciting. It’s pretty easy, too, once you master the timing of the turns. Most of my best scores come from tracks that have one of these sections in them. My other complaint is that sometimes the background color of the city is black, the same as the track, so all you have to go on is the thin gray line that runs down the center of the track. This adds a significant amount of difficulty to the game: it should go or you should earn bonus points for racing when the city is dark. As I mentioned before, Pro mode takes away the camera following you, which is a two-edged sword. When you’re pointed down-screen and want to head to the left side of the screen, you need to press the right arrow. It makes sense but when I’m making turn after turn, sometimes I get mixed up and fly off the track. That’s not a complaint, though; I actually enjoy the challenge. Pro mode also adds tighter turns, which require a quick double-tap to navigate. Pro mode intimidated me at first but quickly became my mode of choice. I’m still playing this game after a few days whenever I want to goof off for a couple of minutes, so it has some staying power despite its repetitive nature. Check it out and discover the joy of surviving for as long as you can before going BOOM. The game is still in development and some elements of it could use some improvement. The version I played was 0.6.803. It is currently up for voting on Steam Greenlight and from the comments there it sounds like several nice improvements are in the works, including controller support. At the end of Part 62, Emperor Banshee asked Allin to explain why he was making demands of an Emperor in exchange for Allin’s cooperation. One does not make demands of an Emperor…. I swallowed and struggled to find the words. Outside the gates I had felt unstoppable, with an army behind me, safe in the knowledge that I was doing the right thing. Now, under Banshee’s gaze and Fordham’s glare, with the weight of the entire court bearing down on me, I felt like exactly what I was: a foolish, inexperienced child making demands of his elders. “Well?” Fordham said, drawing out the word. I imagined him asking, “Cat got your tongue?” which almost made me laugh. I covered it up with a cough and a smile. Here goes nothing. There were titters from the crowd. News of my public refusal of Banshee’s offer must have spread out from the guards at the gate. They might not know the details, but they knew that I had denied their Emperor. At least now they would know I hadn’t done so lightly. Banshee gave me a twirl of his fingers. Let’s hear it. Emperor Banshee stood up and roared. As one the crowd shrunk back and quieted. Fordham, closest to the source, crouched to one side and buried his head in his arms. Fordham stood back up and wiped his hands on his chest, as if he could clean off the cowardice he had displayed. “I wouldn’t want you to waste even one breath responding to such nonsense,” he said. I turned back to the throne as I ended my speech. Fordham looked like he had more to say, but Banshee spoke first, his voice booming. He’s a dangerous one, I thought. What is Tumble doing that’s so important that Banshee would replace him with Fordham? Polite laughter from the crowd, which began to disperse. I thanked Xerxes for standing with me and told him to find me again tomorrow. “Only if you bathe first,” the guard said with a face. He seemed like a genial fellow and I took it as a good sign that Banshee had assigned him to babysit Ballister. Banshee and Fordham were gone by the time I finished talking to Ballister, and most of the crowd with them. None of the remaining cats wanted anything to do with me and I couldn’t blame them after that show between their Emperor and Envoy. Talk to me and one side or another would be furious. It didn’t matter, though. I was exhausted from the past week’s journey, and all the adrenaline was fleeing my body now that I wasn’t on display in front of Pudlington’s collected political might. I made my way to my room fully intending to go straight to bed, but when I climbed in through the window and saw the triptych on the wall, I changed my mind. I had put off thinking about her on the trip back because I had enough to worry about. But now I had set events in motion and could do nothing but wait to see what happened. There would be no way I could sleep until I at least said hello to her and let her know I was back. I half expected Tumble to be standing on the platform outside my window when I climbed back out, but he was not there. Nor did I find Tyena at home. Even before I searched all three floors of her place, I could tell she wasn’t there. The place felt empty, cold. On my way back to the top floor, I heard someone entering through the window. It didn’t sound like Tyena’s footsteps, so I hazarded another guess. “Tumble?” I asked, rounding a corner. But it wasn’t him. It was his brother, standing before me with his shoulders bowed. He sighed and his entire frame jiggled with the out-breath. I’m a little happier with how this past week went. I fell down at the end (thank you, all-day headache and vague outline) but overall I gained a little ground on my word count goal. The crazy thing is, my schedule says I should be done writing Book 2 (1st draft) by Friday, with a total of about 92,000 words. I am near the end, certainly, but something tells me I might need a few more days and a few thousand more words. On the Book One front, my editor continues to push me to make the book better. Why would this happen? This character acts differently each time we meet them. This only seems to happen because it’s convenient to the plot. I can’t wait until I’m done drafting Book Two so that I can get to work on making Book One better. Thanks to everyone who reads, comments, and shares. It truly makes me happy to know that people are enjoying this story. At the end of Part 61, Allin returned to Pudlington along with Ballister and his people and an army of ghosts. He told the guards he was there to fight Banshee’s army for him, on one condition. After many messages to and from the authorities inside of Pudlington, we were granted entrance. Once inside, Xerxes, Ballister and I were asked to meet with Emperor Banshee. Ballister’s people were taken to a holding area and Xerxes’ ghosts agreed to wait outside of the city. Of course, if they had wanted to force the issue and come inside, there was not much the cats could do to stop them short of releasing an electro-magnetic pulse inside the city. It was an odd return to Pudlington. The first time I visited, I was a curiosity. This time, a phalanx of armed guards escorted the three of us through the city and down one of the ramps to stand before Banshee’s stepped dais. It felt less like an honor guard and more like we were prisoners being paraded before a judge. Not a good sign. Besides our manner of entrance, two other sights gave me pause. Instead of six imperial guards around Banshee’s throne, there were at least twenty of the feather-capped fellows standing ramrod straight, hands gripping their halberds. And instead of Tumble standing one step below the Emperor—his brother, I recalled with no small wonder—there stood a cat I had last seen at the first royal dinner I had attended in Pudlington. I couldn’t recall his name, but his attitude toward me then matched the look on his face now: haughty disdain. A large audience of cats milled about the platform, and I was glad for the thick ropes that held up the circular floor we trod upon; it was quite a crowd. The guards had to clear a space so that we could stand a few feet out from the bottom step before Banshee. I glanced to one side and checked on Ballister. He had a grim, determined look on his face that belied how nervous he probably felt. It’s one thing to know that there is a cat city nearby. It’s quite another to be inside of it, surrounded by hundreds of cats, many of whom are armed and unhappy that you’re near them. On my other side, Xerxes stood patiently, a bemused look upon his face, his feet not quite touching the floor beneath him. Not again, I thought, but this time I couldn’t afford to risk offending anyone. I nodded to Ballister and Xerxes and went down on one knee, my head bowed. Out of the corner of my eyes, I saw Ballister do the same, a scowl on his face, while Xerxes opted to sink into the floor down to his knees. I stifled a grin at that. I held back another smile. Entwhistle? “Xerxes.” No courtly flourishes there. Banshee emphasized those last words and I caught a warning in his tone. “Yes, what has become of your brother?” Fordham asked, pulling at his whiskers. Another project? I imagined he must be down in the Skunkworks with Professor Copper, working on the lantern coil. I placed my hand on my chest and felt Matthias’ coil beneath my shirt. I needed to speak to Copper as soon as possible about what I had figured out. The crowd raised its collective voice at this. Even the cats had their legends about the beings that live in the darkened voids of the city. I didn’t disabuse them of the horrifying images invoking their name must conjure. Fordham barely concealed a sneer at my words, and I saw Banshee catch it before it disappeared. “Yes, it is truly amazing what can be accomplished when unlikely allies work together, is it not?” Banshee said, his fingers steepled before him. I was shocked. I thought for sure Banshee would back up my plan, if for no other reason than to annoy Fordham. This was one crazy week, with many distractions and illnesses and assorted other goodies. I managed to meet my minimum word count goal for the first draft of Book Two, but it came down to the wire on Friday night. Here’s hoping next week goes more smoothly. At the end of Part 60, Allin had bested a not-quite-healed Matthias in one-on-one combat and then spared his life. All that remained was to leave Matthias to the merskers, but before Allin could leave the village, he was stopped in his tracks by a ghost. The ghosts. What with the slavers and the merskers and Matthias, I had forgotten all about the silent army of ghosts that had followed me to the mersker village. This was the second time in recent days that one had spoken to me, and this time the ghost had addressed me by name. If I hadn’t been so weary, I might have found the trend disturbing. I felt a cold touch on the back of my neck. I turned and saw the ghost army lining up behind the speaker, walling me off from the village. The ghost light would certainly dissuade the merskers from interfering. I was too stunned to respond. Xerxes was offering me an army of ghosts to use in the fight against Doyle. My head swam at the bizarre prospect. He turned and the mass of ghosts behind him marched into the mersker village. I started to protest that I didn’t want the merskers harmed, but except for the light they gave off, the ghosts did not molest the scavengers. They formed a line to where Matthias lay on the ground and, to his and my surprise, swarmed over him. I saw Matthias’ body rise up off the floor as a constant stream of ghosts moved down the line they had formed, surrounding and supporting him. Matthias began to scream, high and thin whines that lost their strength as more ghosts exerted their will to make one small piece of their spectral bodies solid. Hundreds of ghosts overlapped to hold him in place, using the energy from his own body to power their solidification. The more he weakened, the stronger they became, until he couldn’t resist as they passed him hand over hand down their line. They paraded him past me and away, leaving Xerxes and a few dozen other ghosts behind. I digested that and shook my head. True to his word, Xerxes and the other ghosts guided me back to Pudlington. Without their help, I would probably never have found my way, or if I did, it might have taken another three years. But due to their combined knowledge and ability to scout the best route by fanning out and phasing through walls, I was able to make the trip in a week. Each day, I covered a tremendous amount of ground, and the ghosts helped me find food and water, clean and dry clothing, safe spots to sleep, and most importantly, medicine. Not only had I gotten cut up quite a bit down in the junkyard, but I had been immersed in who knows what filth. Thanks to the ghosts, I managed to stave off any illness. They were also good for conversation. Well, some of them. Even united in their goals, not every ghost was thrilled about helping a living human. I got the cold shoulder from some of them, literally. Others were fonts of knowledge. For instance, I hadn’t known about Pudlington before I met Tumble, but I wondered if even he was aware that six other cat cities still thrived in Earth. As exhilarating as it was to be taken on a whirlwind tour of the city from the basement up, it was a great relief to find myself once again in front of a familiar door. Silence. I had asked the ghosts to wait out of sight so as not to frighten anyone, but now I considered calling one over to peek through the wall for me. I heard the sound of locks opening and I stepped back. The door opened, but only a crack. The door opened the rest of the way and Ballister rushed through it and lifted me into the air by my armpits. “Allin! Tumble told us you died!” he shouted. A weight lifted from me upon hearing that Tumble had survived. I asked how he was. The people inside the room lifted hands in greeting but were otherwise rather listless when I entered. The food that Tumble and I had shared would have all been used up by now; they were back on strict rationing and as little activity as possible. Ballister looked down his beaky nose at me and nodded for me to go on. Ballister was predictably suspicious, not of me, but that my plan would work. We put it to a vote and even had a few of the ghosts join in on the conversation to make sure the mere sight of my allies wouldn’t send Ballister’s people flying under their bed-shelves. I wasn’t sure if they would agree to my proposal, but in the end my promises swayed them to take a risk and leave their safe but squalid nest. After that, it was up to the ghosts to lead us safely through the maze surrounding Pudlington. They pointed out the traps along the way and helped us to avoid or defuse them, so when we reached Pudlington’s inner bailey, no one had suffered an injury or gotten lost. Our passage did not go unnoticed. Instead of two guards outside the gates to Pudlington, there were well over a hundred filling the hallway. I faced them at the head of an odd assortment of the wretched living and stoic undead. And so ends the second third of The Only City Left. I hope you’ve been enjoying it so far and will stick around for the next 30 installments! Here’s my word count for the week. I am so close to being caught up to my goal, but at the same time I need to be writing less and brainstorming more as I move into the endgame of Book Two’s first draft. So as much as I’d like to be caught up or ahead on my word count goal, it may be a while yet before that happens. Also, here’s a slightly updated version of the cover I shared last week. I guess I won’t say this is the final version, because you never know. At the end of Part 59, Allin couldn’t sit idly by while the merskers were being rounded up by slavers, so he made a deal with Matthias. If he could find Matthias’ coil, Matthias would stop the slavers. With the help of a mersker, he found the coil and brought it back to Matthias. Matthias wasted no time once I returned the coil. He slipped the necklace on, pressed the proper buttons, and whispered his passphrase. Just in time, too, because the slavers had finally noticed my constant comings and goings and were heading our way. Matthias, fully transformed, leaped out of the bin, sending mersker food flying in all directions. A loose tentacle flew forward and slapped Dragon-head in the face. He was so busy wiping the slime off from that, he didn’t even notice that Matthias had sliced him open from neck to groin until the werewolf had already moved past. “What’s this then?” he repeated softly, and collapsed first to his knees and then face down. “Hell with you!” said a slaver in response. He shot at him three times, but Matthias grabbed another slaver and used him as a shield before tossing his limp body to one side. The slaver managed to land one dart successfully before Matthias tackled him and exacted his bloody revenge. If the tranquilizer slowed him down at all, I couldn’t tell. It was clear that the slavers hadn’t expected any resistance. After another one took a shot at Matthias and met the same grisly end, the fight went out of the rest of them and they lowered their weapons. The slavers exchanged glances, their thoughts evident: Is this some kind of trick? He didn’t have to tell them again. They sprang into action, dragging limp merskers away toward their trucks. I ran up to Matthias and grabbed his arm. I reached into my pocket and pulled out the tiny device I had stashed there earlier. With a brief prayer that it still worked, I jammed it into Matthias’ side. Electricity flooded into him with a sizzling crackle and I could smell burnt hair. After only a couple of seconds, the battery was drained and the one-time device was useless, so I dropped it. Matthias fell, too, crashing to his knees as he fought to control his paralyzed body. I couldn’t count on that lasting for long, so I did the quickest thing I could think of to neutralize the threat. I reached out and switched his coil to sunlight mode. As he contracted to his regular human proportions, I slipped his necklace off and tossed it away. There, now I stand a chance. I backed away and waited for him to come to me. Tumble would have approved. Behind him, I could see the merskers working to break free of their chains, aided by my friend. I hoped they could free themselves and help their brethren, but I couldn’t spare them any more attention. Matthias lunged at me, the same straightforward fighting style he used as a werewolf. Without the extra size and razor-sharp teeth and claws, it lacked the same effect. I threw myself to the side and landed hard on my right shoulder, but rolled with the fall and was on my feet again shortly. Matthias twisted around to face me, his head down and back hunched, looking savage and primal even as a human. “Face it, Matthias. Without your coil, you’re nothing.” I had to make him angry, get him rattled. I knew that even with his injured leg, he had strength and experience I did not. He responded with a roar rather than sensible speech. This time, when he ran at me, I didn’t dodge. Instead, I threw myself at him, tackling him at the knees. Tumble would have shaken his head. Matthias plowed through me and knocked me aside, but I must have hurt his bad leg, because he fell to the floor and yelled out. He reached for his leg and then pulled his hand back as if afraid to touch it. With Matthias down, I spared a glance at the merskers. They had freed themselves and were going after the slavers. Some of them had destroyed the floodlights that had hindered their ability to fight back. Score one for the little guys. I had to decide what to do with Matthias. I got up and walked over to where he lay, looking down on him by the light of the ghosts. His mouth was set in a grimace and he groaned in pain. Matthias’ grimace transformed into a grin, and his whimpers of pain disappeared. He swept his legs to one side and took my feet out from under me. I hit the floor hard and the impact knocked the breath from my lungs. He jumped nimbly to his feet and reached down to grab me by my hair. The shock and pain of that did nothing to help me catch my breath, and dark spots filled my vision as I gasped for air. He pulled me to my knees and leaned down to speak directly into my ear. He shook me by my hair and it felt like my scalp would tear off my skull. I cried out in pain and he continued. With all my strength, I elbowed him in his freshly-healed leg. The snap of his bone breaking again was the most satisfying sound I had heard in ages. He let me go and collapsed to the floor, his screams of pain genuine this time. I got to my hands and knees and saw one of the mersker’s spears on the ground next to me. I grabbed it, used the blunt end to help me to my feet and then reversed my grip on it and stood next to where Matthias writhed on the ground. His eyes widened as I lifted the spear above my head. He squeezed them shut as I thrust it down at him. And buried the point in the ground beside his head. He opened his eyes and looked at the spear, mere inches away. The mersker ignored my foreign words and raised his spear. I brought mine up in return and thought, I won’t let them take me this time. Instead of attacking, the mersker pointed his spear at me and then swept it around to point out of the village, past the ghosts. He jabbed the spear for emphasis. It wasn’t exactly gratitude, but given the way the merskers were licking their lips while eyeing the captured slavers, I was glad to accept the free pass. I dropped the spear, disgusted by what it represented. It had been a split-second decision to bury it in the ground rather than in Matthias’ skull, and I wasn’t sure which choice I would make if I had to do it again. I felt the darkness of the city creeping into my soul. My mood lightened a bit when, before I reached the edge of the village, my mersker friend caught up to me. He had my bag in one hand and Matthias’ coil in the other. In my haste to leave, I hadn’t even thought of retrieving them, but he had remembered. We couldn’t understand each other’s language and my throat was too tight to speak, so I accepted the gifts without words, head bowed and eyes closed. When I opened them, the mersker was scurrying back to his people. I turned once more to leave, only to find myself face to face with a ghost. 4/7/13 News: Another busy week, but I fought and clawed my way forward on the Book Two first draft, determined to catch back up to my goal sooner rather than later. If I can keep up this pace, it will still be a couple of weeks before I’m back on track, and then there’s only two or three weeks before the first draft should be done, but I’d rather not be so far behind until the very last day. Okay, I’m writing. That’s good. What else? I’m also getting notes back on The Only City Left from my editor. Perhaps the word “notes” does not encompass the amount of suggestions, questions, and polite ridicule that is included in each chapter’s editorial response. Some of these “notes” equal or outweigh the amount of original text. And I’m loving it. 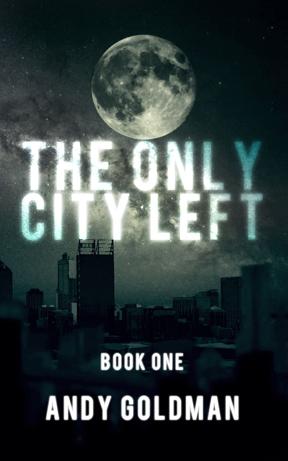 Even though I worked hard to improve TOCL when I created a full-length novel from the serial version, there was still a lot that needed to be done to make the book more engaging. My editor is pointing those areas out to me and, when needed, whacking me upside the head with them. Once I am done drafting Book Two, I’ll be working on the edit/re-write of Book One. I am really really really looking forward to it. Finally, I have a cover for Book One! So without further ado, here it is! I feel that I am finally making some good progress on getting this book produced, but at the same time, I’m not rushing it just to have it out there. My goal is to have it done at least before the serialized version ends (in about 7 more months) and hopefully well before that. We shall see.